Radio Rant: David Guetta ft. Usher – Without You | Ranting About Music! Today’s tune comes from David Guetta’s Nothing But the Beat project, where the French DJ teamed up with some of today’s biggest hit makers to produce hyperactive club songs. Some worked, and some didn’t. 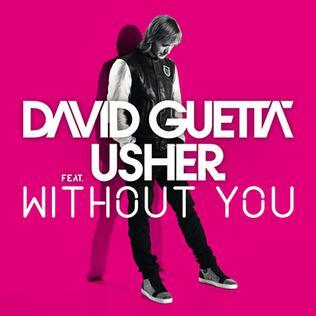 Anyway, before I’d heard it, I thought “Without You” could have gone either way; Usher and Guetta are both very talented artists, but they don’t always make the best decisions. At their best, we get “When Love Takes Over” or “Yeah”, but when they strike out, there’s “Little Bad Girl” and “OMG”. Well, let’s take a look. The nice thing about David Guetta is that at this point, he’s not going to surprise us. His songs are hyperproduced house meets pop affairs that draw on beats, effects, synths, and every now and then, strings, electric guitar, and piano. Dude’s not going to do an unplugged album anytime soon. While his past Nothing But the Beat singles have been all rush with little substance, “Without You” has some texture and craft to it. Built around an electric piano part that I swear is “All My Friends” meets “I Gotta Feeling”, the song adds sprinkling synths and a light but steady beat while strings build up into the chorus. The chorus, centered in danceable but restrained drums and featuring an airy synth, also soars. The build is denser in the second verse with more prominent strings, and with Usher leading the way (more on him in a moment), it’s very effective. Overall, it’s a well-produced song that invokes a bit of wistfulness, but still manages to be upbeat and catchy. Usher, like D.Guetta, has fumbled in the past by making bad collaboration choices, but the two seem to be a good fit. Guetta’s production seems to suit his artists; someone who doesn’t do a lot behind the mic ends up buried on the dancefloor, but he’ll let confident artists take all the room they need. Factor in that Usher is one of the best male vocalists in the pop scene today, and you have evidence that “Without You” should be good. And it is. The first verse, like the music behind him, builds into the chorus, where he sings along with some of the higher synths. It’s the kind of chorus written for stadium-sized crowds. One of the many advantages Usher has over his other competitors is that the guy can wail while not sounding forced or lame; he can slip in and out of his falsetto easier than most. And he uses that to his advantage on the second verse, where he hits the high notes and sounds truly heartbroken. Jason DeRulo should just quit after hearing this. Now, how does “Without You” do in terms of lyrics? Well, it’s kind of…a blank slate. It never really misfires, but there’s no heft to the lyrics at all, either. They’re repeated lines of “I can’t _____ without you”, and that’s it. The lyrics aren’t trying especially hard at all, and it’s my guess that they’re just there to give Usher something to wail. And, to that extent, they work. With a less expressive vocalist, or one that couldn’t express with as much finesse, the song would fall flat. But, as it stands, “Without You” is one of my more favorite pop hits in recent memory. David Guetta puts in some solid production, Usher embarrasses almost every other guy singer on the charts, what’s not to like? Honestly, aside from lyrical inertia, the only other complaint I have is that I feel like the song could use a little more everything; maybe a bridge or something for these guys to really go to work, but that’s about it. Wait, is that two positive Radio Rants in a row? This entry was posted in Radio Rants and tagged David Guetta, music, pop, rant, review, Usher, Without You. Bookmark the permalink.